Mobile has become a major fixture within the business world with more customers choosing to use their mobile devices over more traditional methods. In fact, statistics show that a whopping 50% of all web traffic comes from mobile devices and this number is only going to grow in the future. Therefore, it has never been more important that businesses ensure they are mobile friendly if they want to succeed in the current corporate landscape. However, there is a misconception that many business owners have that this mobile trend is specific to B2C companies and not as important when it comes to B2B, but this just isn’t the case. The move to mobile is happening just as fast within B2B, in fact 50% of B2B queries are made on smartphones and research shows that this number is likely to rise to 70% by the year 2020. It may be that we expect a greater degree of mobile friendly interaction between businesses and customers but many interactions between companies are also happening through mobile devices. A major factor in the rise of mobile in B2B is the impact of millennials on the workforce- obviously this new generation are tech savvy and rely much more on mobile platforms. However, interestingly, statistics have shown that age isn’t the only defining factor as baby-boomers are also conducting more and more business using their smartphones. Therefore, it seems as if the cultural and technological shift that is happening is bigger than the generational divide. A report by Salesforce which looked at over 7000 business buyers found that over 80% of millennials believe that their mobile device is essential to their work. Although the amount of Baby-Boomers who felt the same was lower (over 60%) it’s still the vast majority and signals a shift in thinking. Mobile B2B sales are still relatively low but are continually rising and are likely to make up a significant percentage of revenue in the future. It’s also worth noting that sales figures are not the only measure of the impact of smartphones. 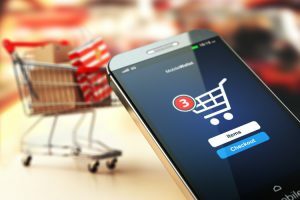 The decision to purchase is often influenced by research conducted using smartphones and tablets and whilst the actual purchase isn’t completed using these devices- they are still playing a vital role in the overall process. The idea of the pre-purchase activity which eventually leads to a sale is often overlooked but it can be vital. Research has found that 70% of executives will use their phone to research a product or service after receiving an offer. Furthermore, 68% of respondents actually use their mobile phones to look at news which is related to their field. What these statistics show is that even if business owners aren’t actually making purchases on a mobile platform- they are being influenced by phones and tablets. Taking all of this in to account- it’s obviously beneficial to have a website that is mobile-friendly because it allows potential customers to not only research products and services but also encourages them to make the actual sale. Interestingly, a mobile friendly website can have a significant effect on brand loyalty. 90% of B2B buyers are more likely to repeat business with a company that provides a good mobile experience- compared with only 50% of buyers who said they would repeat business with a company that offered a poor mobile experience. Clearly, this is an aspect of the B2B landscape that is important to a lot of buyers. The interaction between businesses is changing, in fact it seems to be becoming much more like a conventional business to customer relationship. Ensuring that the process is as easy and satisfactory as possible is integral and this includes constructing a website that is tailored to desktop and mobile platforms. This entry was posted in Observations & Answers on September 1, 2018 by Roland.